Facebook party which invited 'Maraya'! 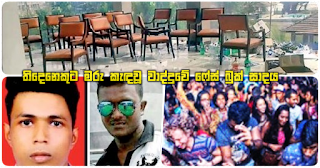 Four persons were admitted to Panadura hospital in a sick condition which had occured most suddenly during a DJ party held at a coastal hotel in Wadduwa area organised after a publicity campaign across Facebook and of the four, three persons have died yesterday (5). admitted is serious, a hospital spokesman said. The referred to person admitted to the intensive care unit is a young boy aged 22 from Potuhera. The party has been organised by a commercial agency in Kaduwela under the name 'Hijay Leaching'. Due permission too has been obtained from relevant parties for this purpose. The party concerned has been organised under protection of a leading security firm and bringing any stuff from outside had been prohibited. What police say is that this function has started day-before-yesterday (4) around 7.30 in the evening with about thousand eight hundred participants attending it while the organisers have charged Rs. five thousand per head in the case of VIP tickets and Rs. three thousand for ordinary tickets. Police suspect that the four persons admitted to hospital may have become sick because of some poison entering their system as a result of some tablets / pills or liquid. A high police officer remarked that this could be determined after the magisterial inquiry which would be conducted today (6). A person who attended the party has said that the interior of the building which hosted the invitees has still not been rennovated and finished and since there was dust on the floor under those circumstances, the four hospitalised may have fallen sick having breathed the dust. However, on inspection it was observed that the floor of the building was well tiled. The building where the party was held was of two floors and what police say is that they were able to detect on the top floor some small polythene wrappers which could be suspected as wrappings of narcotic pills. Police say that statements were recorded in this connection from the publicity manager of the firm which organised the party. Further, it was revealed that permission had been obtained under special license to issue beer from 6 in the evening to 12 midnight on day-before-yesterday (4). the day on which the party was held and services of a private security firm was installed for protection of the hall. This party was highlighted with local and foreign singers and in the meantime four participants were taken ill and they were admitted to Panadura Basic hospital in the ambulance parked at the party premises. Police say that those who attended the party had taken various types of narcotics. Wadduwa police who were notified about this incident yesterday around 7.00 in the evening yesterday had launched a special investigation about it. Two persons were reported dead by dawn yesterday while the other has passed away in the afternoon. the dead bodies are lying at Panadura hospital for post-mortem procedures. The post-mortem is expected to be held today (6).